Download our printable list of 301 Bible questions for Kids. Use them in a fun quiz style game with children, teens, or adults. PDF or Word Doc options below. Please leave me a comment if you find any errors (or want to add your own favorite questions to the next update. As with any resource, please consider the level of children you are teaching. Our Bible quiz questions include a mix of simple and hard questions. For younger children, choose the easy questions or turn the right answer into a true or false option. Enjoy and please leave us a comment about how you’re using this material in your church or Sunday School. Q: What is the first book in the Bible? Q: What is the last book in the Bible? Q: What four books tell about Jesus life on Earth? Q: Which book did Jesus directly write? Q: What is the longest book in the Bible? True or False: David wrote the entire book of Psalms. False: The Psalms are a collection by many writers, but David contributed the most. Q: What is the shortest book in the Bible? Q: How many books are in the Bible? Q: How many books in the Old Testament? Q: How many books in the New Testament? Q: Which NT book has Jesus’ Sermon on the Mount? Ture or False: The Bible was first written in the English language? Q: In what language was most of the Old Testament given? Q: In what language was most of the New Testament given? Q: Which human author wrote the most books? A: Paul wrote 13 books. Q: Which human author wrote the most words in the Bible? Q: What was most likely the first Gospel written? Q: What was most likely the last Gospel written? Q: What was most likely the first of Paul’s letters written? Q: What was most likely the last New Testament book written? Q: How many days did God take to create the world? Q: What day did God create man? Q: Who was the first man? Q: Who was the first woman? Q: Where did they live at the beginning of the world? Q: Who were their three sons listed in the Bible? Q: Who did God tell to build an ark? Q: Who were Noah’s three sons? Q: How many days and nights did it rain when Noah was on the ark? Q: How many people were saved on the ark? Q: What was God’s sign to Noah that he would never destroy the earth again? Q: What were men trying to do at the Tower of Babel? A: Built a tower to reach to Heaven. Q: How did God make them spread out across the earth? Q: Who did God call out of Ur to move to Canaan? Q: Who was Abram’s wife? Q: Even though Abram and Sarah were too old, what did God promise them? Q: When God showed Abram the stars in the sky, what did he promise? A: That Abram would have more descendants than the number of stars. Q: Who was Abram’s handmaid? Q: What was Sarah’s idea for Abram to have a child? A: For Abram to have a child with Hagar. Q: Who was the first son he had? Q: What was Abram’s name changed to? Q: What was Sarai’s name changed to? Q: What was the second son Abraham had? Q: Who did Abraham have his second son with? Q: Where did Hagar and her son leave to? Q: Who did Abraham send to find Isaac a wife? Q: Who did the servant choose? Q: What were Isaac’s sons’ names? Q: Who was born first? A: Esau came first, with Jacob grabbing his heel. Q: How did Esau provide food for the family? Q: Who did Isaac favor of his two sons? Q: What did Jacob do most of the time? A: Stayed in the home with his mother. Q: What did Esau receive in exchange for his birthright? Q: As Isaac was dying and blind, who suggested that Jacob should steal the blessing? Q: How did Esau respond when his birthright was taken? A: Threatened to kill Jacob. Q: When Jacob met Laban, which daughter did he want to marry? Q: Who did Laban trick Jacob into marrying? Q: What did Laban make Jacob do to finally marry Rachel? A: Work another seven years. Q: Who was the first son Jacob had with Rachel? Q: What did God change Jacob’s name to before his meeting with Esau? Q: How many brothers did Joseph have? Q: What did Jacob give Joseph that sparked jealousy from his siblings? A: A coat of many colors. Q: What did Joseph tell his brothers about his dreams that upset them? A: The dreams said he would become greater and rule over them. Q: How did the brothers get rid of Joseph? A: Sold him to slave traders. Q: What did Joseph’s brothers tell their father had happened to him? A: They said Joseph was killed by a wild animal. Q: Where did the slave traders take Joseph? Q: Who got Joseph thrown into prison by lying about him? Q: Who else was in prison with Joseph? A: The Pharaoh’s cupbearer and chief baker. Q: What did Joseph do for them? Q: Why was Joseph summoned out of prison by the Pharaoh? A: To interrupt his dream. Q: What position of power was Joseph given by the Pharaoh? A: Second in command of Egypt. Q: What catastrophe did Joseph predict by interpreting the Pharaoh’s dream? A: A severe, seven-year famine. Q: Who came to Egypt that Joseph recognized because of the famine? Q: Who was Jacob’s second son with Rachel? Q: What did Joseph tell the brothers to do next time they came back to Egypt? A: To bring Benjamin with them. Q: Which brother volunteered to stay in Egypt instead of Benjamin? Q: What did Joseph tell his brothers to do when they returned to Canaan? A: Bring their families and their father to Egypt. Q: How did Moses’ mother save him from the Egyptian soldiers? A: Put him in a basket in the river. Q: What did Moses do after he killed an Egyptian? A: Ran away into the desert. Q: Through what did God speak to Moses in the desert? Q: When Moses confronted the Pharaoh, what did his staff turn into when he threw it on the ground? Q: What did Moses say God commanded the Pharaoh to do? A: Let the Israelite slaves go free. Q: How many plagues did God send on Egypt? Q: What was the final plague that convinced Pharaoh to let the slaves go? A: The firstborn son of all Egyptian families died. Q: When Pharaoh changed his mind and sent his army after the slaves, where did they meet at? Q: What did God through Moses to save the slaves? Q: When the Egyptians tried to follow the Israelites through the Red Sea, what happened? A: The water crashed on them and killed them all. Q: What did God send to feed the Israelites in the desert? Q: Where did God give Moses the Ten Commandments? Q: What golden image did the Israelites make at Mt. Sinai? Q: What did the spies sent into Canaan see that made them scared? Q: Who were the only two Israelites allowed to go into the Promised Land after many years? Q: What city did God make the walls fall so Joshua and the Israelites could conquer it? Q: After they took over the Promised Land and Joshua died, who ruled Israel? Q: Who was the woman judge who led Israel to victory? Q: Who was the judge who defeated the Midianites with only 300 men using torches and horns? Q: Who was the judge who took a Nazarite vow from birth and fought against the Philistines? Q: With what did Samson kill 1,000 Philistines? Q: What Philistine woman asked Samson what his power came from? Q: How did Samson die? A: Pushing over the temple pillars, killing himself and many Philistines. Q: Who was the first king of Israel? Q: Who anointed him king? Q: Who was the enemy who took the Ark of the Covenant? Q: What happened the idol which was beside the Ark in the enemy’s temple? Q: When the people demanded Saul make a sacrifice to God that only priests should make, what did he do? Q: When Saul conquered the Amalekites, what person did he keep as a prisoner instead of killing like God said to? Q: What was Saul’s punishment for disobeying? Q: Who was the king of Israel anointed by Samuel after Saul? Q: What did David work as for his father? Q: When the Philistines came to attack the Israelites, who mocked God and challenged them? Q: When David wanted to fight Goliath, what did Saul try to give him? Q: What did David take from the brook to fight Goliath with? Q: How many sling-throws did it take David to hit Goliath? Q: Who was Saul’s son that David befriended? Q: What did Saul throw to try to kill David? Q: What did Jonathan do to save David’s life from Saul? Q: What foreign country did David run away to? Q: Did Saul give up on chasing David when David went into the wilderness? Q: How many times did David spare Saul’s life? Q: Where did David spare Saul’s life the first time? Q: Where did David spare Saul’s life the second time? Q: What last judge of Israel died after Saul made a temporary peace with David? Q: Where did David go after Saul continued to hunt him? Q: Where did Saul turn to for advice when he couldn’t sense God’s will? Q: What prophet did he ask to speak to? Q: How did Saul die? Q: How many of his sons died in the same battle? Q: Did all of Israel immediately consider David their king? Q: Who was David’s captain of his army? Q: When David stayed in Jerusalem, what woman did he see and commit adultery with? Q: Who was Bathsheba’s husband? Q: When Bathsheba got pregnant, what did David make happen to Uriah? Q: What prophet came to rebuke David? Q: What happened to Bathsheba’s child? Q: When Bathsheba had another child, what did they name him? Q: Who was David’s son that started a rebellion against him? Q: What capital city did David abandon as Absalom came towards it? Q: When the two armies battled, what happened to Absalom’s hair? Q: Because he killed Absalom, what was Joab’s punishment? Q: What was David’s second sin recorded in the Bible? Q: During his time as king, who was David’s main enemy? Q: Which books of the Bible record David’s time as king? Q: Which book did David write most of? Q: Who was David’s son that became king? Q: What trait did Solomon pray for from God? Q: What did Solomon build for the Lord? Q: What famous queen came to visit Solomon? Q: How many wives did Solomon have? Q: Did Solomon always follow the Lord? A: No. He turned from God. Q: Who convinced Solomon to turn from God? Q: What happened to the kingdom after Solomon’s rule? Q: Which books of the Bible record all the kings? Q: Which books of the Bible did Solomon write? Q: How many kings of Judah were there? Q: How many kings of Israel were there? Q: Who conquered Judah and took Daniel to their country? Q: Whose dream did Daniel interpret in -Babylon? Q: Who was the last king Daniel served under in the Bible? Q: When Daniel prayed to God after it was not allowed, where was he thrown into? Q: What were Daniel’s three friends (Babylonian names)? Q: When they refused to bow to an idol, where were they thrown? Q: Who returned to Israel to build up the walls of Jerusalem? Q: What Israelite saved her people from being murdered and was a wife of the king? Q: What daring thing did Esther do to talk with the king? Q: Who let the Israelites return to their homeland? Q: Who eventually came from the lineage of David? Q: Who was Jesus’ human mother? Q: Who was Jesus’ adoptive father on Earth? Q: Who was Jesus’ birth father? Q: Name the city where Jesus was born? Q: Where did Jesus’ family go when Herod wanted to harm him as baby? True or False: Because Jesus was God, he didn’t obey his parents’ rules. True or False: Jesus was an only child. Q: How many of Jesus’ brothers are named in the Bible? Q: How many of Jesus’ sisters are named in the Bible? Q: Name one of Jesus’ brothers? Q: Who was Jesus’ most famous cousin? True or False: John the Baptist wore clothes made of goat hair? Q: Who spoke from the sky when Jesus was baptised? Q: What did God say? A: That he was well-pleased with his son. Q: What happened when Jesus went into the wilderness? Q: Before Jesus starting preaching, what was his normal job? Q: True or False: Jesus turned water into Coca-Cola? A: False, Jesus turned water into wine. Q: Besides preaching, name an activity Jesus did while traveling in Galilee. A: Healing the sick and casting out demons. True or False: Jesus stayed away from people with bad reputations? Q: Name the place where Jesus walked on water? True or False: At first, Jesus family tried to stop his ministry and said he was crazy. True or False: Jesus said his true family was anyone who obeys God. True or False: Everywhere he went, people loved Jesus and believed his message? A: False – many times Jesus was rejected. Q: Which member of the Jewish ruling counsel came to ask Jesus questions at night? True or False: Jesus didn’t like the people because they worshiped God the wrong way? Q: How many disciples did Jesus choose? Q: What was Matthew before he followed Jesus? True or False: Jesus would sometimes “spit” as part of his healing miracles. Q: What is the shortest verse in the Bible? A: John 11:35 Jesus wept. Q: Why did Jesus weep in that verse? A: Because his friend Lazarus died. Q: How many days was Lazarus dead before Jesus came to visit? Q: What 2 things did Jesus do to raise Lazarus back to life? A: He prayed and then told Lazarus to come out. Q: Who helped pay the bills for Jesus and the disciples ministry? Q: Name the demon Jesus cast out in the region of the Gerasenes? True or False: While on Earth, Jesus had the power to raise dead people back to life? Q: How much bread and fish did Jesus use to feed over 5000 people? True or False: Jesus’ said washing hands is never important. A: False – he said dirty hands don’t make a person spiritually unclean. You can still get germs! Q: What was Peter and Andrew doing when Jesus’ called them to follow him? Q: Name the two Old Testament people who appeared when Jesus was transfigured? True or False: Jesus ask the children to stay back while he was teaching important things to grown-ups. Q: What problem did Bartimaeus have that Jesus fixed? True or False: When Jesus went to the Temple he always used his inside voice. Q: How many people did Jesus feed with fish and bread? Q: How many lepers did Jesus heal when only 1 returned? Q: What did Jesus do at the Last Supper to his disciples? True or False: Jesus said only big money offerings were important to God. Q: What did the woman pour on Jesus’ feet at the home of Simon the Leeper? Q: Name the disciple who betrayed Jesus. Q: What garden did Jesus go to when he prayed after the Last Supper? True or False: The Jewish leaders tried to set Jesus free. Q: Who gave Jesus a crown made of thorns? Q: Name the Roman Governor who sat over Jesus trial? Q: What did Pilate do to “cleanse himself” of the crucifixion? Q: Who cut off a soldier’s ear when Jesus was being arrested? True or False: Jesus didn’t know that he was going to be arrested and killed in Jerusalem. A: False – He knew and told his disciples before it happened. Q: Which disciple denied Jesus three times? Q: What happened to the temple curtain when Jesus was killed? Q: What happened after Jesus was buried in the tomb? Q: What was rolled away from the entrance of the tomb? Q: What day of the week did Jesus rise back to life? Q: How many days before Jesus returned to Heaven? Q: How did Jesus leave Earth and go to Heaven? Q: How many people saw Jesus after he came back from the dead? Q: What was another name for the Apostle Paul? Q: Who was the first Christian to die for his faith? Q: How many books have the name John in them? Q: Who preached at Pentecost? Q: What amazing miracle happened with languages? A: Everybody heard the sermon in their own language. Q: What happened when he was on the road to Damascus? Q: What was his name changed to? Q: Who was exiled to an island? Q: Who was crucified upside down? Q: Who was the first martyr and was stoned? True or False: Ananias and Sapphira died after lying to the Apostles about their offering. Q: How many deacons were chosen to help the apostles to distribute food to widows? Q: Which Apostle took the Gospel to the city of Samaria? Q: Which Apostle shared the Gospel with an Ethiopian official on the road to Gaza? True or False: Peter raised a woman named Dorcas from the dead. Q: Where did Peter stay during his ministry in the city of Joppa? Q: What did Peter’s vision about the unclean animals mean? A: That all people can be made clean through Jesus – aka non-Jews can be saved. Q: In what city were Jesus’ followers first called “Christians”? True or False: Peter was rescued from prison by an Angel. Q: Who went with Paul on his early mission trips? True or False: Paul had a vison of a man calling him to come over to Carthage. True or False: God sent an earthquake to rescue Paul and Silas from prison in Philippi. Q: What did the Philippian jailer say to Paul after he heard the Gospel? A: What must I do to be saved? Q: How did Paul and Silas respond? A: Believe in the Lord Jesus, and you will be saved. Q: What was Paul’s goal in his missionary journey? Q: Where can you find the 10 commandments in the Bible? Q: Name the person who received the 10 Commandments from God? Q: What is the preamble or introduction to the Commandments? A: I am the LORD your God who brought you out of Egypt (slavery). Q: What is the 1st commandment? Q: What is the 2nd commandment? A: You shall not make idols. Q: What is the 3rd commandment? A: You shall not misuse the name of the LORD your God. Q: What is the 4th commandment? A: Observe the Sabbath day by keeping it holy. Q: What is the 5th commandment? A: Honor your father and mother. Q: What is the 6th commandment? A: You shall not murder. Q: What is the 7th commandment? Q: What is the 8th commandment? Q: What is the 9th commandment? A: You shall not give false testimony. Q: What is the 10th commandment? True or False: Jesus said the OT rules don’t matter anymore. Q: How many rules does Jesus use to summarize all the OT rules? Q: What does Jesus say is the first and greatest commandment? A: Love God with all your heart, minds, soul, and strength. Q: What does Jesus says is the second commandment? A: Love your neighbor as yourself. Q: Where is the Fruit of the Spirit found in the Bible? Q: Which human author wrote Galatians? True or False: Bananas are a fruit of the Spirit? ? A: False – Bananas are a gift from God but not considered spiritual fruit in Galatians 5. Q: Name any of the 9 Fruit of the Spirit. Q: Where in the Bible can you find the Lord’s Prayer? Q: Who taught the Lord’s Prayer? Q: How many requests are in the Lord’s Prayer? Q: What is the 1st petition? Q: What is the 2nd petition? Q: What is the 3rd petition? Q: What is the 4th petition? Q: What is the 5th petition? Q: What is the 6th petition? Q: What is the 7th petition? True or False: The more words we say makes our prayers better. 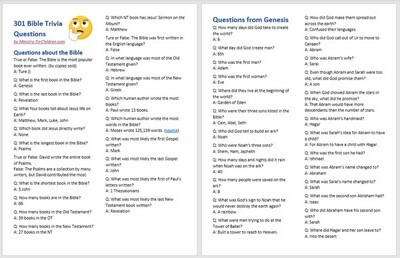 One simple way to use extra time in Sunday School or Children’s Church is Bible trivia questions. Whenever possible we make a fun game out of it. This post includes some printable Bible questions for kids and some tips for making the most out of it. You could use them for group games or ice breakers with any age group – kids, teens, or adults. Divide the youth into teams and make it a quiz game. Bible trivia for kids is no waste of time. Using the right questions can review important facts from God’s Word. Knowledge about the Bible can help children, just make sure you don’t forget the Gospel. Leave a comment below if you have some questions you would like to add. Your help is greatly appreciated by other readers too. We’d love to update this list and make it even more amazing. We ran out of steam once we got to the later chapters of Acts. So there are many more simple bible questions you could add. Wow, this is wonderful — thank you so much! Wow! this is very good. The children feel sometimes then they know everything about the Bible’s History and feel a little boring. The Bible Trivia is going to make the kids to learn more and have more fun time , they will feel more busy. Thank you very much! That’s a great point. Giving a little challenge to the “over-churched” kids can make things fun. We tried include a good mix of easy versus hard questions. When we play, I always offer the children a “lifeline” choice if the question stumps the whole class. For example, I would give them multiple choice, making up two false answers to accompany the correct. Depending how you score the quiz game that could be worth less points or something. Anyway, thanks for the encouraging comment and have fun! This is wonderful. but the shortest verse in the bible is john 11 : 35 Not 36 as you have put it. Tony Kummer (Editor) reviewed & updated this page on : April 10, 2019 at 5:29 pm. All our content is peer reviewed by our readers, simply leave a comment on any post suggest an update.